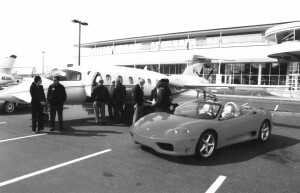 The Piaggio Avanti P180, one of the sexiest aircraft now flying, appropriately appeared with Ferrari sports cars at the Business Aircraft & Jet Preview, April 25, at Boeing Field. Paul Woodard, manager of marketing and technical sales, and Kelley Pitts, sales and marketing administrator of Piaggio America, Inc., were present to handle the high level of interest in the Avanti. There is a connection between the two companies. 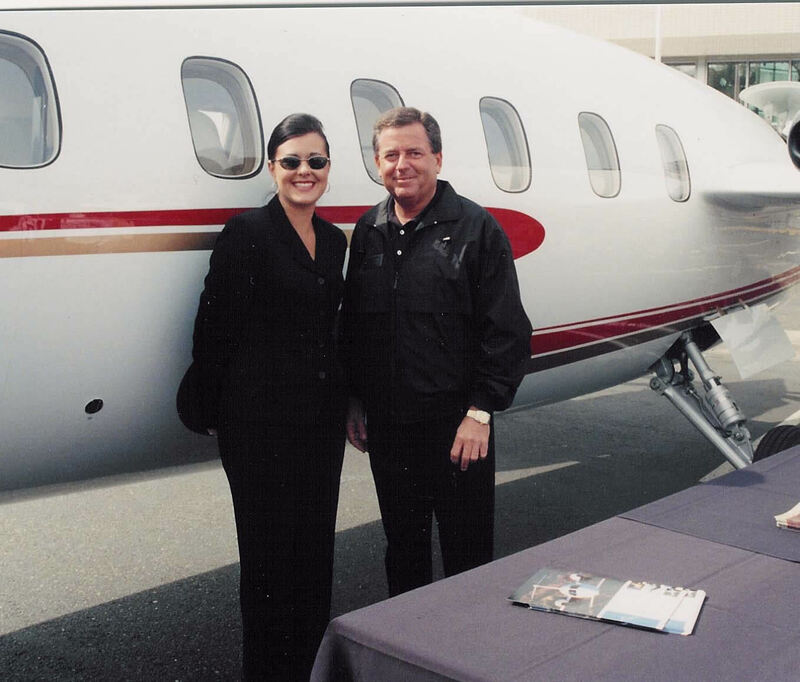 Piero Ferrari, the son of Enzo Ferrari and 10 percent owner and executive vice chairman of Ferrari, is also chairman of Piaggio Aero Industries. Ferrari’s involvement in Piaggio is his “personal involvement only, not the company’s.” However, he says, Ferrari completely supports these ties with Piaggio. In 1998, Piero Ferrari, the Di Mase family, and other investors acquired the assets of troubled Piaggio, with Jose Di Mase becoming CEO. Re-launched as Piaggio Aero Industries (SpA Piero Ferrari), Piaggio established Piaggio America, Inc., in 2000, as a subsidiary. Steve Hanvey serves as Piaggio America’s president. Michael McMillan is vice president of sales and marketing. Since then, there has been worldwide recognition of the aerodynamically efficient Avanti P180, which Ferrari says is the best in its class. The involvement has lead to its increasing sales record. Research and development for the Avanti P180 began in 1979 with aerodynamic configuration studies. Piaggio’s facility in Finale Ligure, Italy, tested the first wind tunnel model that year. Completed in 1986, research and development included extensive aerodynamic and structural design and wind tunnel, structural, ground vibration and flight testing. One of the most interesting results found during the developmental flight test activity was the Avanti stall behavior at high altitudes. Due to separation of flow near the wingtip, greater wing rolls were experienced than allowed by airworthiness regulations. Modifications to the airfoil shape were introduced. On the forward wing, the leading edge was sharpened to anticipate the stall and, on the outboard main wing, the leading edge was dropped in order to delay it. The results were very predictable stall characteristics and an easy recovery. The program go-ahead was given in 1983, with the flight in September 1986, and FAA certification in March 1990. After 30 Avanti P180s were built, the production was halted and Piaggio went into receivership. The Avanti P180 cockpit layout includes two complete crew stations, although the Avanti is FAA certificated for single pilot operation, with no type rating required. There are dual flight controls, adjustable rudder pedals and brakes. Crew seats are fully adjustable and include a four-point restraint harness. The left seat pilot’s side instrumentation includes a three-tube EFIS (electronic flight instrument system). This consists of a Collins EADI (electronic attitude director indicator) and EHSI (electronic horizontal situation indicator) and an MFD (multi-function display). The pilot’s altimeter, airspeed indicator, and vertical speed indicator are AC and are driven by an ADC (air data computer). The right seat co-pilots side instrumentation includes an electro-mechanical attitude indicator and an EHSI. The co-pilot’s airspeed, altimeter, and IVSI (instantaneous vertical speed indicator) are pneumatic and connected to a separate pitot/static system. Power plant instruments are conventional dial-type (steam-gauge), but with digital readouts. The Avanti has a well-designed Collins Flight Director/Autopilot that is capable of coupled instrument approaches. The modes of operation of the autopilot can be divided into two groups: lateral modes (heading, navigation, level, approach, back course) and vertical modes (speed, altitude, altitude select, climb, descent, vertical speed). The autopilot is also able to perform yaw damper, soft ride, and half bank functions. The system includes a trim switch, SYNC button, and AP-DISC switch on the control wheel. The aircraft can be equipped with the Universal FMS (flight management system) to provide advanced flight capabilities. The target specifications of the Avanti P180 program were to accommodate up to nine passengers in a very comfortable cabin. It has cabin dimensions in a class with the Hawker, Falcon 50, and Learjet 60. The streamlined fuselage is shaped like a bullet with no discontinuity for the pilot’s windshield. A special manufacturing technique allows a very smooth metal fuselage external surface to reduce drag. A mid wing passes through the aft fuselage without penalizing the passenger cabin space. Before flying the Avanti P180, all designated pilots receive a complete ground school training package at the location in Greenville or the Piaggio Aero Industries location in Genoa, Italy. The flight training is presently conducted in a real aircraft until a simulator is ready for service. The aircraft is certified in the transport category including day, night, VFR, IFR, and flight into known icing conditions. Two Pratt & Whitney of Canada Inc. PT6A-66 turboprop engines are rated at 1,485 shaft hp, and flat rated to 850 shaft hp. The engines drive two Hartzell five bladed, aluminum, counter-rotating, pusher propellers, which have a reverse thrust operation and autofeather system. The PT6A-66 installed on the Avanti can maintain the flat rated 850 shaft hp during cruise or climb to approximately 25,000 feet on a standard day. This flat rated power is available to 57 degrees C (134 degrees F) intake temperature at 2,000-rpm propeller speed while at sea level. The design philosophy of the Avanti requires high power only at altitude to fly at high speed. The advantages of having a flat-rated engine include the fact that from sea level to about 25,000 feet, the torque (gearbox) limits the engine power; in these operating conditions, an excess of thermodynamic power is available to reset the shaft power when necessary. The gearbox is designed to transmit the rated power, so that it is lighter than that required to transmit the full thermodynamic power. There is no power reduction due to operation from high altitude runways, up to 25,000 feet, or at high ambient temperature (up to 57 degrees C or 134 degrees F) intake temperature at sea level. Fuel efficiency is better than any other multiengine turbine aircraft. It can squeeze out more miles per pound of aviation jet fuel than any other pressurized twin turbine in production. The Avanti maximum fuel capacity (usable) is 418 U.S. gallons or 2,802 lbs @ 6.7 lbs/gal. This provides a maximum range of 1,750 nm with five passengers and a crew of one and VFR reserves. IFR cruise range at maximum cruise power (2,000 rpm) at 35,000 ft would be 1,260 nm. Targets specifications called for flying at a max speed of 400 knots, with cruise altitude of 41,000 ft., and having a range at max cruise speed of at least 1,000 nautical miles, while carrying four passengers with IFR reserve. It has been the fastest aircraft in its category since it entered service in 1990. Operating speeds on the Avanti are stall speed in the landing configuration, 93 KIAS; maximum operating speed, 260 KIAS or 0.7 Mach; maximum flap operating speed for MID position, 170 KIAS, and DN position, 150 KIAS; and maximum flap extended speeds, 180 KIAS for flaps MID and 175 KIAS for flaps DN. Maximum landing gear operating speed is 180 KIAS, and the maximum landing gear extended speed is 185 KIAS. Minimum control airspeed is 100 KIAS, with rotation speed, at 11,550 lbs, 106 KIAS. Best rate of climb speed is 160 KIAS; best angle of climb speed, 140 KIAS; and maneuvering speed, 199 KIAS. Kelley Pitts, sales and marketing administrator, and Paul Woodard, manager of marketing and technical sales of Piaggio America, Inc., were present to handle the high level of interest in the Avanti. Looking at the past, present, and the future helps to understand how the Avanti P180 flies so fast. The 1903 Wright “Flyer” had a lifting surface in front of the main wing, and two pusher propellers in the rear. The Boeing “Sonic Cruiser,” which should debut in 2008, also has a lifting surface in front of the main wing, and two pusher power plants in the rear. The key to the Avanti’s speed and efficiency is its patented three lifting surface configuration and attention to aerodynamic details. It has a laminar flow fixed forward wing with flaps, a high aspect ratio main wing with conventional and Fowler flaps, small horizontal stabilizer, streamlined fuselage, and delta ventral fins. Piaggio engineers were the first to apply an extended natural laminar flow on a general aviation aircraft wing. Care was taken in designing the airfoils and identifying optimum solutions for structural design and the manufacturing procedures to obtain very low tolerances on surface contour and waviness. Piaggio engineers applied a NASA developed methodology, designing a rear-loaded airfoil for the main wing, taking advantage of the pushers’ undisturbed laminar airflow over the main wing. Laminar flow produces less drag than turbulent flow, but it is not easy to achieve or maintain. The exclusive airfoil geometry of the Avanti P180 wing and pusher propeller configuration allows a laminar flow to exceed 50 percent of the chord. Pusher propeller slipstreams do not disturb the airflow over the wing, and improves the longitudinal and directional stability of the aircraft, while producing a much lower sound level in the cabin. The two propellers are counter-rotating, improving lateral and directional trimming as well as avoiding the problem of the “critical engine.” The 5-blade pusher propellers were designed specifically for this aircraft. The Avanti’s forward wing is a fixed lifting surface with flaps that move with the main wing flaps. The forward wing pitch angle is set so that it stalls before the main wing, allowing a nose down effect. The delta fins also provide a strong nose down pitch force at high angles of incidence preventing the deep stall. Pilots like flight controls that are mechanically connected to the cockpit controls by way of cables, pulleys, push-pull rods and bellcranks in a closed loop system. This direct connection to the ailerons, elevators, and rudder is as good as it gets for a dual-pilot configuration. Secondary control is provided by the aileron and rudder trim tabs for roll and yaw, and by the all-movable horizontal stabilizer for pitch. The Avanti flap system consists of main wing outboard flaps, main wing inboard flaps, and forward wing flaps, electrically driven to up, mid or takeoff position, and down for landing configuration. The hydraulic system provides power for nose wheel steering, wheel braking, landing gear extension, and landing gear retraction. Hydraulic power is generated by a Vickers hydraulic package operating in three modes—high duty, low duty and non-operating. The electrical system includes a dual parallel main bus distribution system laid out so that power is maintained to essential equipment by the essential bus with a failure of a single power source. Two Lear Siegler starter/generators are used for engine starting and generate DC electrical power. One Marathon nickel-cadmium battery provides power for starting and serves as a reserve source of emergency electrical power in the event of a dual generator failure. Two static inverters provide the AC electrical power for the avionics equipment. An external power receptacle allows use of auxiliary ground power for engine start or ground check of the electrical system. The environmental control system uses engine bleed air for cooling, heating, and pressurizing the cabin. Two outflow valves on the rear pressure bulkhead regulate cabin pressurization. The Garrett pressurization controller provides both an auto-schedule mode and a crew selection dependent control. The 9-psi system provides a 6,500-foot cabin altitude at 41,000 feet and maintains a sea-level cabin up to 24,000 feet. Engine bleed air is routed through a Hamilton Standard three-wheel air-cycle machine to provide air conditioning for the cabin. A Scott storage cylinder provides oxygen to the pilot and co-pilot positions through quick-donning Eros diluter/demand masks. Automatic dropout, constant flow oxygen masks are provided at each passenger position. An ice detector probe and a visual ice accretion probe indicate potential icing conditions. Main wing leading edge anti-ice is accomplished by directing engine bleed air through a diffuser duct installed in the main wing leading edge. The forward wing leading edge contains an electrically activated de-icing blanket on the aluminum alloy leading edge. Nacelle inlets are de-iced by pneumatic boots. Electric heating of both pilot and copilot windscreens guards against or alleviates icing and fogging. The engine exhaust serves to heat the metal propeller blades, so no de-icing system is needed. When planning flights in the Avanti, the pilot must carefully calculate performance capabilities under existing and forecast conditions. A computer flight planning capability such as the Jeppesen FliteStar program for corporate aircraft worldwide is advisably helpful. The Jeppesen FliteMap program with GPS input can also help achieve more efficient flight. The Jeppesen JeppView/FliteDeck program allows for greater situational awareness. All of the latest state-of-the-art Electronic Flight Bag applications will assist the Piaggio Avanti P180 fly with less weight of paper documents onboard.